An office is an area of work, which operates best when there are sufficient tools of work and most importantly the required atmosphere. An office is required to be neat at all times, something that can only be assured with the use of daily routine tools such as office leather office desk coasters. People have various ways of ensuring that an office is safe, clean and neat, however, most of the items they use aren’t appropriate. Considering that an office is a place where people will meet business dignitaries to discuss business related matters, the place needs to be very presentable and neat. The use of desk coasters has been on the rise, considering its efficacy in the protection of desks and surfaces from damages such as stains, dirt, and water rings. 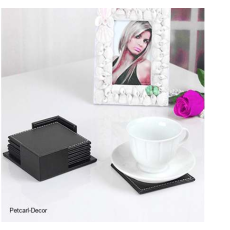 What makes desk coasters more effective is the aesthetic value it comes with since besides being protective, it also very beautiful and classy.